The next phase in the church's expansion into Turkey began in Acts 13:1. Here the prophets and teachers in the church at Antioch set apart St. Barnabas and Saul for a ministry work to which the Holy Spirit had called them. From Antioch's port on the Mediterranean called Seleucia Pieria, the two sailed with John Mark to St. Barnabas' home on Cyprus. At Paphos several important events took place: Saul began to use his Roman name St. Paul, St. Paul assumed leadership of the apostolic party, and the Roman proconsul Sergius Paulus became a believer. The proconsul owned numerous estates in the region of Pisidian Antioch; and perhaps because of his recommendation, the apostles sailed northward to the coast of Asia Minor landing at Perga, where John Mark left them. St. Paul and St. Barnabas proceeded inland, crossing the rugged Taurus Mountains before they arrived at Pisidian Antioch (Acts 13:13-14). Here on the first Sabbath they preached in the synagogue. Verses 13:16-47 recall St. Paul's first recorded sermon in Acts as well as the first recorded sermon in Turkey. St. Paul's ministry in Pisidian Antioch is shortened by opposition from the Jews and leading men and women of the city. Such opposition became a familiar pattern throughout St. Paul's ministry travels. The pair traveled to Iconium where many also believed. Again persecution drove them down the road to Lystra, where St. Paul was left for dead. Following a miraculous recovery, he and Barnabas continued to Derbe where many also believed. The two retraced their steps to strengthen the disciples and appoint leaders in the churches. These four churches in the southern portion of the Roman province of Galatia - Pisidian Antioch, Iconium, Lystra, and Derbe - became the core of St. Paul's churches in Anatolia. 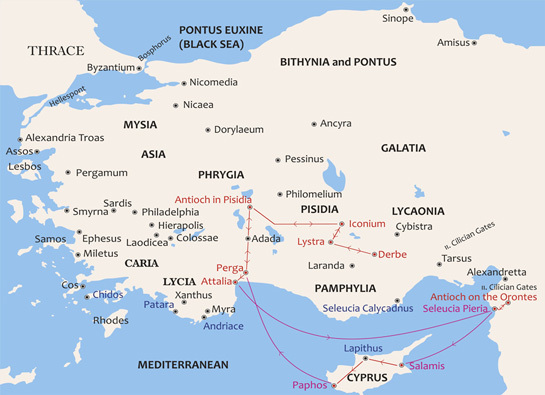 The apostles returned to Perga, and this time caught a ship at Attalia for their return to Antioch. The church there was greatly encouraged that God had opened the door of belief to the Gentiles (14:27). This first journey can be dated approximately to the years 47-48.